People always talk about stand-up comedians and their timing – but you seldom hear people comment on the excellent timing of writers. And yet timing is essential to making a piece of writing work. You need to know when to hold back, and when to continue, when to pause and when to stop altogether. You need to sense when to set something up and when to pay it off (rather like the comedian’s punch line.) When you reach the exact point you should pull the curtain on a scene, you should feel it somewhere deep in your gut. I think the best way to learn timing is to read a great deal. When I read this recently, I was struck by the great timing, and how it forced me to turn the page. It stops at a point where a good couple of questions still hang in the air. Nothing has been answered. It’s just the perfect place to end this scene. Isn’t it great? There is a pause in which Iris can hear the man moving his lips over his teeth. ‘I’m afraid I must contradict you,’ he says eventually. Click here for our 2016 dates. 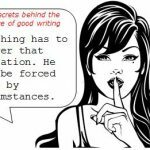 My 2016 blogs will continue to try to uncover the secrets behind the practice of good writing. Please join the discussion and if you have discovered something that has made a great difference to some aspect of your writing, please send it to me. I’ll share it on the blog and we can discuss it. Each blog will deal with a secret that may have occurred to me through reading or mentoring other people’s work. Or they may be lessons hard learnt through five of my own books. Many will be applicable to fiction and non-fiction, while some might refer to one or the other. When you tackle a piece of writing, you always have a vision of the perfect work it will be. As you write, you become increasingly aware of how it falls short of the perfection you wish for it. Writing (and rewriting) is the process of trying to bring it as close as you possibly can to that vision. Here, I will try to share those little gems which should bring all our writing one step closer to the perfect piece of writing – one blog at a time. Some might tackle the process of writing or how to keep writing, while some will look at language, characterisation or story. Some might be more general, while others will be very specific. But each will be a piece of advice that I believe in and that I hope will help make us all into better writers.